At Cornucopia, we want to be more than a natural food store. We want to do good for our community and our world. That’s why we are proud to be a Certified B Corporation®. B Corps are a new type of company that uses the power of business to solve social and environmental problems. This business community directly reflects core values that guide our work each day. B Corp certification is to business what Fair Trade certification is to coffee or USDA Organic certification is to milk. Certified B Corps are important because they inspire all businesses to compete not only to be the best in the world, but to be the best for the world. As a part of this business community, we can use our power to enact positive change in this world to make it a better place for us and future generations. 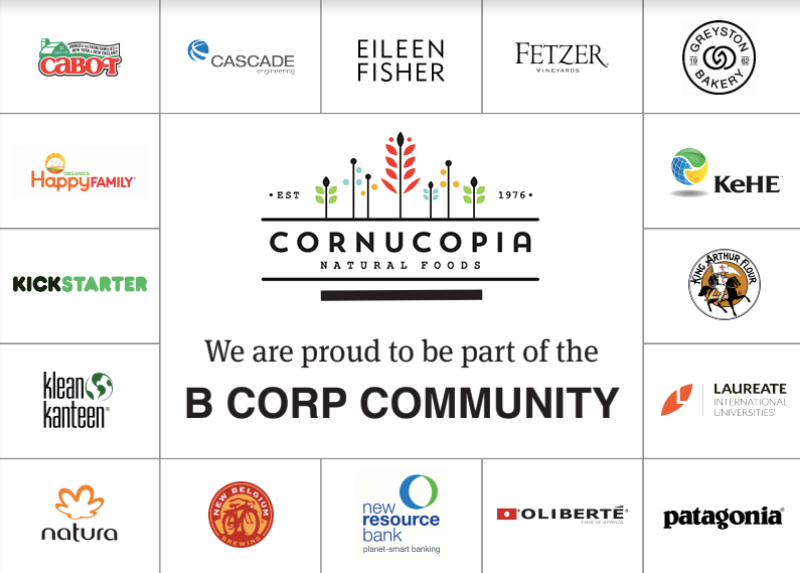 Cornucopia was certified by the non-profit B Lab to meet rigorous standards of social and environmental performance, accountability, and transparency. We’ve evaluated how our practices impact our employees, our community, the environment, and our customers. Check out our B Corp Impact Score here. We are proud to join companies like 1% for the Planet, Dr. Bronners, and Ripple in redefining success in business, so that one day everyone uses business as a force for good!